Upon entering Hannah Joyce’s apartment, a delightful aroma envelops you and makes your mouth water. On the stove is a dish full of lasagna… the definition of yummy! This lasagna has a personal touch, though, and not because it was homemade. 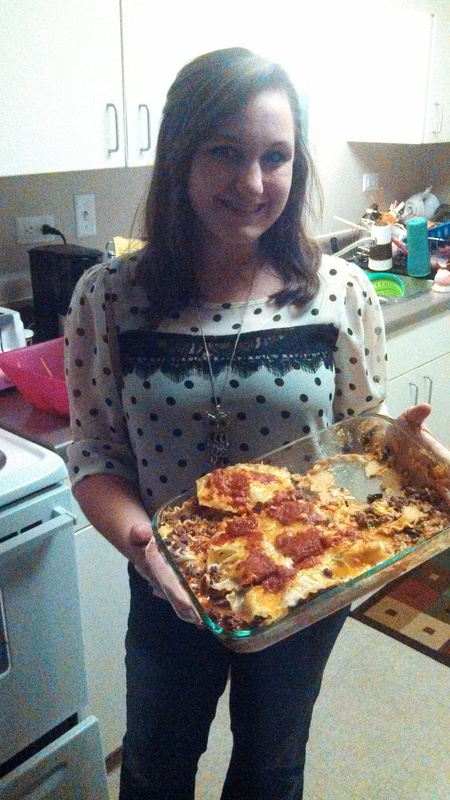 The spinach lasagna was made with deer meat that Hannah harvested herself. It certainly explains her pink camo apron she is wearing. Hannah is an avid marksman and hunter. Like any good hunter, she utilizes the meat that she harvests, whether it is dove, deer, or another meat; she makes delicious dishes with it like meatballs, BBQ dove, and that scrumptious spinach lasagna. Not only does using this meat make great meals, it is also a cheaper alternative to buying it in stores. Deer often tastes just like beef, and dove is as tender as chicken can get. Since before she could walk well, Hannah has donned her camo garb and gone hunting. Her dad would carry her around on his shoulders to go rabbit hunting. Her interest really peaked when she was about 10 years old. She started getting involved in all forms of hunting with different guns and bows. Although she hunts many things including deer, rabbit, swan, dove, ducks, geese, and more, her favorite thing to hunt is bear. “I love crawling through the bays (thickets) and hearing the dogs run!” she exclaims. Hunting is always an adventure, and something that Hannah loves, but she doesn’t just hunt. She has competed for 7 years through a program called Hunter Safety in her school. Every year she would compete with rifle, bow, shotgun, orienteering (compass), and a hunter safety exam at both district and state levels. Not only this, but she would compete at the national level too. “Every summer I competed in the National YHEC (Youth Hunter Education Challenge). At Nationals I shot bow, rifle, shotgun, and muzzle-loader, took a muzzle-loader knowledge test, compass test, map reading, and orienteering, a large hunter safety test, hunter safety trail, and Cherokee run (a fun survival challenge),” Hannah explains. She wouldn’t just compete, but also win, typically doing better than the guys. She is definitely a force to be reckoned with! Hunting and shooting are passions of hers and she has a knack for making some yummy food. She certainly knows how to bring camo to the kitchen. Hannah is a senior as a Communication major with a concentration in broadcasting. She is from East Bend, North Carolina. Be sure to check out her recipe. It is really good! Directions: Cook noodles. Cook and Drain meat. Spread 1/2 cup tomato sauce mixture in bottom of 13×9 pan. top with four noodles. Layer with 1 cup spinach, 1/2 cup ricotta cheese, half of the white sauce, 1 cup mozzarella cheese, half of the meat, and 1/2 cup cheddar cheese. Repeat. Top with remaining noodles, tomato sauce and mozzarella cheese. Bake at 350 degrees for 30 minutes.